Indian wines are catching up on the global scene, which is paralleled with the growth of rosés. Our climate and culinary preferences make rosé wines an uncomplicated and obvious choice. They pair well with our myriad spices and complex cooking techniques and pose as a single drink that carries over from aperitifs to partner with various dishes throughout the meal, says SI contributor, Gagan Sharma. York Vineyards and Sula Vineyards make playful, blush type wines with Zinfandel, while Fratelli and Grover Zampa have taken the dry Shiraz route, with Vallonné Vineyards producing the lone-ranger Cabernet Sauvignon rosé. Other producers, like Nine Hills, Turning Point and Four Seasons are yet to define their identity. Chandon, Sula Vineyards and Grover Zampa make rosé bubblies that offer a delectable option and a great evening of sipping wine. Whether it’s the reluctance of educated palates and serious wine lovers, or rosé’s positioning as a playful, picnic wine, rosés have been underrated and incorrectly regarded as a non-intellectual style. Who says all wines must be complex and mystic? For those times when you are tired of decoding the big guns, and simply want to pause and sip a pleasant wine to reenergise and refresh yourself, reach for a Rosé! The York blush wine is a good blend of serious structure and playful flavours. It is a dry wine with a moderate refreshing acidity, gently extracted soft tannins and balanced alcohol. Ripe cherries, dried plums and cranberry skin fill the palate along with cloves and black pepper with a hint of herbaceousness. A little residual sugar balances the spice and acidity, making it an easy drinking option. The Vallonné Cabernet Sauvignon rosé has a refreshing aroma of sweet raspberries, dried cherries and currants with a touch of sour cherries, ripe plums and currant leaf; with a crushed floral bitter finish. The wine has a velvety texture with a creamy mouthfeel and makes a good pairing with roasted kebabs, Thai curries and tempura. 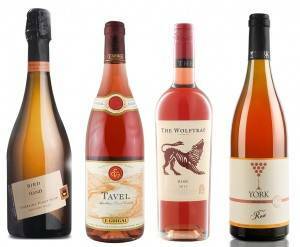 Among the most refined and serious of rosés, Tavel leads from the front. The epitome of the rosé wine style, Tavel is often Cinsault based delivering structure, body, tannins and masculinity, with Grenache adding fruitiness and acidity. Hailing from a warm region, the wine has a cranberry colour, moderate tannins, alcoholic warmth and balancing acidity. Ripe dark fruit notes paired with earthy touches and an underlying spiciness makes it one of the most masculine and serious rosés in the world. Teppanyaki dishes, sushi, seared tuna, pan-seared pork chops are a worthy pairing with the wine. Serve chilled and drink between two to five years old. A South African homage to the southern Rhône Valley style of rosé, this wine is made with Syrah, Cinsault and Grenache. It’s a deep coloured wine with a trio of serious grape varieties that contribute to its off-dry, fruit-rich palate filled with notes of sweet cherries, ripe plums, tropical fruits and a hint of warm spices. Stony minerality is balanced with acidity leading to a dry finish. A good staple for brunch and tapas,the Wolftrap pairs well with mezzo platters, chicken empanada, caramelised onion tart and Indian kadhai preparations. Given its delicate attributes, round palate and soothing acidity, Bird in Hand rosé sparkling makes a great aperitif and companion for mildly flavoured dishes. This Pinot Noir-based bubbly promises finesse, a delicate creamy mouthfeel and ripe acidity with underripe flavours of strawberries, cherries, raspberries, a hint of stoned fruits and earthiness.Crisp, minerality and a Granny Smith apple tang leaves a clean aftertaste. A forerunner of the Austrian bubbly scene, Schlumberger rosé is produced from the trio of classic local red grapes – Zweigelt, St Laurent, and Blaufränkisch. It has the sweet fruit aromas of ripe plums, strawberries and raspberry compôte with lifted florals and fresh rosé petals. Sweetness is obvious but structure balances it with gripping tannins and minerality. It goes well with roasted Duck breast and cream cheese, melon and prosciutto as well as sautéed seafood dishes. Grover Zampa’s Syrah-based Soirée Brut is undoubtedly the most consistent sparkling wine label in the country and hence amongst the most respected. The Syrah contributes dark fruit flavours, favourable body, soft acidity and mild touches of spiciness at the back. It has lingering, limey acidity, under-ripe raspberries and strawberries, a creamy palate and mouth feel, filled with a persistent mousse which finishes on a minerally tone. A safe bet for any occasion. Moët & Chandon entered the Indian winemaking scene with lots of promise. An interesting East-meets-West approach of blending Syrah with Pinot Noir was quite a gamble but it has paid off well. The wine has low intensity of under-ripe flavours of cherries, strawberries, and raspberry crush coupled with finely lifted cranberry skin tannins, lemony acidity and a minerally bite. A good pairing with canapés, roast chicken and steamed fish dishes. A clean, bright appearance, the wine’s bronze amber shade with a fading rim indicated development and age. Medium intensity of strawberry aromas mingled with underripe raspberries, shrubs, celery and white pepper. A clean, dry palate with tart cherry acidity produced a crunchy grip on the mouthfeel. The palate carried forward the shrub and stalky notes from the nose subdued with a gentle malolactic finish, and overall paucity of fruit. Drink now. Clean, tad watery appearance with a salmon pink hue leaning towards a dull onion skin colour, showing signs of development. Clean nose with medium intensity of pink grapefruit, strawberry balm, raspberry chew, and fruit candy, with a hint of spiciness. Clean, dry palate with ripe fruity acidity. Underripe red stoned fruits, touch green, excessive creamy palate shadowing the lack of structure and hitting boozy back. Drinking wine, won’t age. Classic salmon colour with dull appearance. Clean but unappealing metallic nose with notes of smoke, jalapenos, corn chips and wet leaves. Tired palate, with absolute lack of structure. Metallic mouthfeel with tones of dried herbs, dustiness, mustiness, and barely any fruit. Well past its prime. Clean dull bronze-orange appearance, definite signs of ageing. Clean nose with low intensity albeit fruit-forward. Dried rose petals, dry raspberry candy, hints of orange, and metallic iron-rust. Clean off-dry palate with an unmissable oxidative front, chemically tweaked appeal, metallic back, with hints of spice, shrubs, stalks, and a touch of savouriness. Past its prime. Clean appearance with a beautiful pale pink colour. Bright and youthful. Clean aromatic nose with tones of white florals, peach iced tea, raspberry skins, violets, candy and incense. Palate, clean and dry with fruity sweetness, refreshing round acidity and light body. Notes of strawberries, sweet dried cherries, candy chew, elderflower and violets, with an intense peach marmalade finish. Well integrated and appealing. Drink now. Also received for tasting, the Four Seasons Blush was not in good condition and tasted cooked, possibly due to heat damage. The Sommelier India Tasting Panel (SITP) meets every alternate month to taste wines. The bottles are masked and the wines tasted ‘blind’. Wine notes by Gagan Sharma.